The Defence Minister, Mr Pranab Mukherjee, has ruled out a rolling fund mooted by the previous government for military hardware purchases, saying such a concept is not constitutionally or legally valid. Two former MPs belonging to the TDP today decided to quit the party and join the Telangana Rashtra Samithi. The decision to switch over to the sub-regional party was taken at a convention of the Telangana protagonists calling themselves “TDP rebels”. Everybody loves a winner. This is precisely why several Congress leaders today want charge of Haryana. The state is headed for Assembly elections early next year and the Congress graph here is on the upswing. Both Houses of Parliament will meet on July 5 for the two-month Budget session with Finance Minister P Chidambaram presenting the 2004-05 Union Budget in the Lok Sabha on July 8. 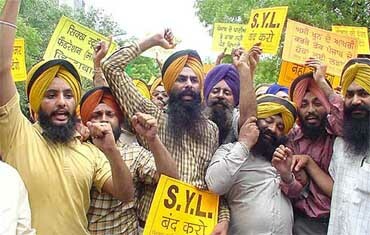 Activists of the Sikh Students Federation (Mehta) Punjab protest against the diversion of Punjab waters and demand stoppage of construction work on the Sutlej-Yamuna Link Canal at Parliament Street in New Delhi on Saturday. A day ahead of the BJP Parliamentary Board meeting here to decide the fate of Gujarat Chief Minister Narendra Modi, the RSS today cautioned the BJP of sending a “wrong message” that “somebody is sacrificed” because of Gujarat. 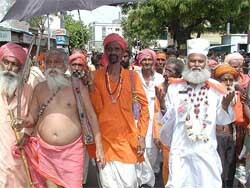 A Muslim saint participates in a Rath Yatra procession in Ahmedabad on Saturday. Easing of visa norms for Canadian citizens visiting India and a free trade agreement will help improve trade ties between the two countries. Mr Herb (Harbans) Dhaliwal, a member of the House of Commons in Canada, says there is a huge potential to expand trade ties between India and Canada. Easing of visa norms and better connectivity in flights will go a long way in promoting trade and cultural ties, he says. Close on the heels of the UPA government’s declaration that it would repeal the controversial Prevention of Terrorism Act ) passed by the previous NDA government, several civil right organisations have intensified their fight against the anti-terrorism law, demanding its immediate abolition. India will stand in the forefront of international efforts to expand the horizons of peace and to reduce and eliminate the crevices of terror and the Prime Minister, Dr Manmohan Singh was committed to this goal. Sexual harassment is part of work culture in media organisations in India, according to a report released by the Information and Broadcasting Secretary, Mr Navin Chawla, here on Saturday. The 130-page report is based on a study commissioned by the National Commission for Women. At least 16 persons were killed as monsoon rains lashed almost all parts of Uttar Pradesh during the past 24 hours, official sources said here today. The state capital recorded the maximum rainfall of 109 mm. A seven-member Indo-Nepalese team on Thursday scaled Saser Kangri peak in the Karakoram ranges. Saser Kangri-I (25,170 feet) is the highest summit of Saser Massif in the eastern Karakoram, deep in the Nubra Valley of Ladakh. It is considered one of the most difficult and formidable peaks in the world. Delhi to see a nightlife soon! 500-year-old jamun tree attracts thousands. In his first interview since assuming office last month, he also said “institutional arrangements” would be put in place for both emergency and regular purchases of military equipment. Mr Mukherjee said the new government had an open mind on integrating the armed forces but would like to review existing integrated structures before deciding on the appointment of a Chief of Defence Staff (CDS). “There is no concept of any rolling fund in our system (under which) every penny is to be approved by Parliament,” Mr Mukherjee told IANS in an interview at his South Block office. “Every expenditure proposal is to be approved by Parliament (and) every withdrawal of money from the consolidated fund of India is to be approved by Parliament,” he said. The previous BJP-led coalition government had in February announced the setting up of a Rs 250 billion ($5.3 billion) Defence Modernisation Fund for acquiring military hardware. The fund was meant to be “non-lapsable”, meaning the ministry would not have to surrender the fund if it was not used within the fiscal year it was allocated for. Mr Mukherjee, however, said all financial allocations were made for “365 days, starting from April 1 and ending on March 31 of the following year”. “Therefore, those type of concepts are not permissible in our constitutional and legal format,” he said. He said the new government would constantly “endeavour to see that our armed forces acquire the requisite skill, equipment, modernisation and... state-of-the-art technology to equip themselves better to meet the challenges from anywhere”. “It is simply bad management when the country is unable to modernise its armed forces despite availability of funds,” he said. Mr Mukherjee noted that the previous government had failed to make “any further headway” after starting the process for creating the post of CDS, who was to serve as a “single point reference to the government on defence matters as well as being in command of the strategic forces”. The new government would review the functioning of India’s first integrated command in the Andaman and Nicobar Islands, which combined elements of the Army, Navy, Air Force and Coast Guard, before deciding on the appointment of the CDS. Prominent among them were former MPs M. Rajaiah and Chandulal, former TDP minister Rajesham Goud, former MLA P. Subhadra and city general secretary D. Mallappa. “The TDP is not willing to accept the cause of Telangana, hence we have decided to join hands with the TRS to work for a separate state,” Mr Rajaiah, who had earlier represented the Siddipet Lok Sabha constituency in Medak district, told reporters after the meeting. He said all the likeminded TDP activists would resign on June 23 and join the TRS the next day. Significantly, the dissent in the TDP coincides with the TRS joining the Congress government, heralding the first coalition experiment in the state. While none of the 11 TDP legislators from the region joined the rebel camp, a large number of lower-level functionaries and representatives the local bodies are likely to gravitate towards the TRS. Everybody loves a winner. This is precisely why several Congress leaders today want charge of Haryana. The state is headed for Assembly elections early next year and the Congress graph here is on the upswing. This was evident in the recent polls where the Congress won nine of the 10 Lok Sabha seats. In case the same story is repeated in the assembly election, the AICC general secretary in charge of Haryana will automatically claim credit for the victory. As speculation about an AICC reshuffle gathers momentum, many Congress leaders are hoping the Haryana charge comes their way. In sharp contrast, there is reluctance to take responsibility for the election-bound state of Maharashtra, where the Congress is battling massive anti-incumbency. In the event of a defeat, the general secretary in charge becomes a prime target of attack. Till any formal announcement is made, there is no stopping the ongoing guessing game about the imminent changes in the Congress organisation. One view in the party is that Mr R.K. Dhawan, general secretary in charge of Haryana, Bihar and Jharkhand, may be replaced as the senior leader is all set to enter the Rajya Sabha from Bihar. Since the Congress convention is not to give a general secretary charge of a state he represents, Mr Dhawan may be given some other responsibility as the three states he is looking after are clubbed together. On the other hand, there is an equally strong view that Mr Dhawan, still remembered as Mrs Indira Gandhi's all-powerful aide, will retain his charge because of his seniority and old clout in the party. He is also considered close to Mr. Bhajan Lal, Haryana strongman and chief ministerial contender. If senior Congress leaders appear reluctant to take charge of what are perceived as "losing states", the state of Uttar Pradesh is a step ahead. The party is finding it difficult to identify an effective person to head the Uttar Pradesh Congress Committee (UPPCC). Party sources said since the next focus of attention is on reviving the party organisation in UP, changes in the state unit are under serious consideration. Former PCC chief Salman Khursheed is a top contender for the post but his appointment is linked to the party's strategy in UP. If the party decides to take on the Mulayam Singh Yadav Government, Mr Khursheed will be seen as the best choice given his antipathy to the UP Chief Minister. But if the Congress leadership opts for a go-slow approach, the party will look around for another candidate. Mr Sanjay Singh, a former MP from Amethi, is in the reckoning but party sources rule it out on the ground that Congress president Sonia Gandhi and Rahul Gandhi are also associated with Amethi. Mrs Rita Bahuguna Joshi, Mahila Congres chief, is a front runner but her detractors may foil her chances. Mr Rajesh Mishra's name is also doing the rounds but he could lose out because he is related to Mr Harishankar Tiwari, a minister in the Mulayum Singh Yadav Government. A Rajya Sabha press communique said yesterday that the President had summoned the Rajya Sabha to meet on July 5. “Subject to exigencies of business, the session is scheduled to conclude on September 3,” it said. The Lok Sabha Secretariat had issued a similar note on Thursday stating that the session would begin on July 5 and end on September 3. Both Houses will have a recess in between. The Railway budget will be presented on July 6 and the Economic Survey will be released on July 7. “It is the prerogative of the BJP to decide who should be the Chief Minister in a state, but what we want to emphasise is that no message should be conveyed to the effect that it is because of the Gujarat riots that the party could not perform well in the elections and because of that somebody is sacrificed,” RSS spokesperson Ram Madhav said. Mr Dhaliwal, who called on Prime Minister Dr Manmohan Singh as a representative of the Canadian Government to invite him for a visit, says the opening up of Indian economy in the past decade had led to "a whole new attitude." He sees nothing amiss with the UPA government's emphasis on social sector. "Reforms will be the same but you have to pay attention to social sector," he says. Mr Dhaliwal says racial and religious harmony should be the priority of the new government as incidents like riots in Gujarat affected India's image. "Both minority rights and human rights are important," he says. Having known Dr Manmohan Singh since 1993, Mr Dhaliwal says India's new Prime Minister "had tremendous credibility all over the world." Dr Manmohan Singh's becoming Prime Minister is seen as a sign of maturity of India's democracy, he says. Mr Dhaliwal, who accompanied Canada's Prime Minister during his visit to the Golden Temple last year, says Punjabis all over the world felt a sense of pride at Dr Manmohan Singh assuming the high office. The MP from Canada says the UPA government should reach out to Indian diaspora, which had been "ignored till recently." Many of them are experts, he says, and are willing to contribute to India's progress. An interesting similarity between Canada and India, says Mr Dhaliwal, is that Sikhs in the two countries are about 2.5 per cent of the population. He says with nearly 30,000 Indians coming to Canada every year, they are the second largest immigrant community whose contribution to Canada's economy and culture is valued. Elected to the House of Commons from Vancouver-South, a constituency with multi-cultural population, Mr Dhaliwal has been a minister for six years with portfolios of revenue, fisheries and oceans and natural resources. An MP for three terms, Mr Dhaliwal chose not to contest the current parliamentary elections in Canada scheduled at the end of this month. "I will return to my business," he says. He informs that 35 persons of South Asian origin are contesting this month's parliamentary poll in Canada. Mr Dhaliwal hails from Dhingrian village near Phagwara. His grandfather moved to Canada in 1908. The World Punjabi Organisation yesterday held a dinner in honour of Mr Dhaliwal which was attended by Lok Sabha Deputy Speaker Charanjit Singh Atwal, NCM chief Tarlochan Singh, former Union Minister Sukhdev Singh Dhindsa, Mr M.S.Gill, MP, columinst and former Rajya Sabha member Kuldip Nayar, besides business leaders. High Commissioner and Deputy High Commissioner of Canada in India were also present. Speakers, including Mr Vikramjit Singh Sahney, president, World Punjabi Organisation, said Canada had done a lot to preserve ethnic identity of minorities living there. Close on the heels of the UPA government’s declaration that it would repeal the controversial Prevention of Terrorism Act (POTA) passed by the previous NDA government, several civil right organisations have intensified their fight against the anti-terrorism law, demanding its immediate abolition. Activists of the Peoples Union of Civil Liberty (PUCL) and the Jan Hastakshep, another civil rights organisation, today urged the Manmohan Singh government to abolish POTA at the earliest to prevent its further “misuse”. Addressing a seminar organised by the Jan Hastakshep at the Gandhi Peace Foundation here, socialist leader Surendra Mohan and noted author Rajendra Yadav said all civil right organisations should intensify their movement against draconian laws like POTA. Former Bihar Chief Secretary K.B. Saxena, who has been associated with the PUCL and the Jan Hastakshep after his retirement, said it was an irony that when the Union Government was talking of repealing POTA, some state governments were contemplating to enact identical laws. In fact, the Gujarat Government had passed such a law recently, he said. The President should not give assent to such legislation, he added. PUCL leader N.D. Panchauli demanded that besides repealing POTA, all cases registered under the Act should also be closed. Jawahar Lal Nehru University's professor Dr Imtiyaz Ahmed demanded an independent inquiry by a high court judge into the Ahmedabad encounter. This was stated today by Minister of State in the Prime Minister’s Office Prithviraj Chavan while inaugurating the “International Round Table on Constructing Peace, Deconstructing Terror” organised by the Strategic Foresight Group of the International Centre for Peace Initiatives, here today. As the largest democracy in the world, India could legitimately claim a lead in this process, he added. He called for a macro level re-ordering of ideas on challenging terrorism, ideas of universal acceptability yet relevant to local conditions. The world was able to abolish slavery and to turn back on colonialism. The time has come for terrorism to be dealt with the same way, he added. The minister said India had been a victim of terrorism for decades and had lost two of its Prime Ministers to terrorists but the world attention focussed on this menace after the events of 9/11. The bitter experience of terrorism, the price, both human and economic that the country had to pay, endowed it with a unique perspective, which stood relevant to the world at large and must be shared widely. Mr Chavan said that terrorism might have regional roots, but armed with latest technology, it now has global reach. Democracies were the prime targets of terrorism and were vulnerable because of their open and transparent political systems. Freedoms enshrined in the constitutions were exploited to foment social and economic discord. At the same time, democracies were also the best armed to take on the scourge of terrorism. “The Indian policy has shown its resilience, whether it is Jammu and Kashmir or Punjab or the North East. The two-day conference is being attended by a representative group of strategic thinkers from Western and Asian countries. The participants include Ambassador Richard McCormack, former Under Secretary of State, USA, former US Congressman, Mr Stephen Solarx, Mr Lawrence Korb, former Assistant Secretary of Defence, USA, Mr Vidar Helgesen, Deputy Minister of Foreign Relations, Norway, Dr Sergei Karaganoy, Chairman of Presidium, Council of Foreign and Defence Policy, Russia, Members of Parliament and experts. The NCW chairperson, Dr Poornima Advani, said the study by the Press Institute of India (PII) had been an eye-opener about the status of women in the print media. In August, the NCW plans to hold a national consultation with 200 journalists across the country on the subject. On the PII’s suggestion for setting up a cell, Dr Advani said journalists should not hesitate in approaching the NCW and the state women commissions to take up cases of harassment. 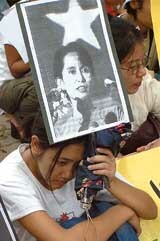 She urged women journalists to break their silence and speak up. Dr Advani also called upon journalists in other media organisations to use their pen to write about the problems faced by their sisters in other media organisations. “Women journalists are vocal and articulate but when it comes to discrimination at the workplace, they are silent. Why?” she asked. “The fact that women journalists did not want to respond for fear of job security and the rampant discrimination which goes unreported, shows the dismal state of affairs in media establishment. We must create a pressure lobby to help women journalists fight the unjust system,’’ the NCW chairperson said. The PII team has inferred that either women do not know how to do anything about sexual harassment, or for a wide variety of reasons, choose not to do anything about it. Only 15.2 per cent of women who experienced sexual harassment had made a formal complaint. According to the report, journalists working for English and vernacular newspapers suffer discrimination, sexual harassment, disparities in pay and denial of promotions. Contrary to popular public perception, the condition of these activists in print is far from rosy. While reporting her findings about the status of women in Bihar, Chhattisgarh, Jharkhand and Madhya Pradesh, Sushmita Malviya, a member of the research team says the concept of women journalists in MP and Chhattisgarh does not exist. Another researcher, Surekha Sule from Mumbai, has reported that some women journalists have been promoted only once or twice during a service of over 20 years. Although the Press Institute of India team led by its Deputy Director, Ms Usha Rai, could not get a very representative sample, it succeeded in highlighting the problems women faced in their work environment. The study has expressed concern about high job insecurity, contract system of employment, neglect of maternity and child-catre provisions and sexual harassment. “Monsoon has reached eastern Uttar Pradesh and heading towards western part,” Met Director R.K. Verma told reporters here. The officials in the Home Department said that at least 16 persons were killed in rain-related incidents. The deaths were recorded due to house collapse. Eight persons died in villages in Bahraich, 140 km east of Lucknow, while three died in Gonda. Three persons, including a three-year-old boy, were killed when the roof of their house collapsed in Lucknow. In Lucknow, it has been raining continuously for the past three days. Met officials have predicted similar weather for the next 24 hours. “Another low pressure system is heading towards UP from the Bay of Bengal. There could be more rains,” the officials said. Bareilly recorded 98 mm of rainfall, while in Allahabad 52 mm of rainfall was recorded. The expedition team, led by Lieut-Col S.P. Malik, had to brave inclement weather and western disturbances at higher camps since mid-May. They had to make a number of attempts before they conquered the peak.